Oriental Zucchini and Brown Rice Salad, quick and easy summer recipe. Starters Fish Chicken Beef Pork, Lamb One Dish Salads Potatoes Vegetables Sides BBQ Misc. I use 'Uncle Ben's' which is all I can get and it is quick cooking. It looks like brown Basmati and cooks in 15 minutes. You could substitute Basmati, if you prefer. 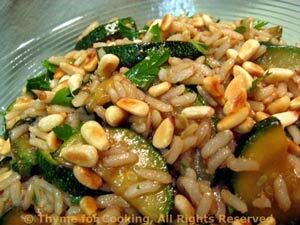 The cooked rice is combined with the sautéed zucchini and a light, oriental vinaigrette just before serving. Cook rice in stock according to package directions. Slice zucchini in half the long way and then into 1/4" (.6cm) slices. Heat medium nonstick over medium heat. Add pine nuts and toast, shaking pan occasionally until golden, 4 - 5 minutes. Remove nuts and set aside. In same skillet heat oils over medium heat. Add garlic, ginger and soy sauce and sauté briefly. Add courgette and continue to sauté for about 15 minutes, stirring occasionally with a wooden spoon, until zucchini is tender. To finish: When rice is done put into a medium bowl. When zucchini is done add to rice. Add the vinaigrette and toss well. Sprinkle with pine nuts. Serve. Put all ingredients in small bowl and whisk well - will not emulsify. Measurements in this color are actual measurements used for calculation. If there are no values the nutritional numbers were simply too small. I try to be accurate, but I do not guarantee it. I use 'grams' as the unit of weight; with an approximate conversion to ounces. Do you have a garden? Or a farm that supplies fresh fruits and vegetables? Thyme for Cooking offers healthy, delicious, quick and easy recipes, using fresh, seasonal foods.